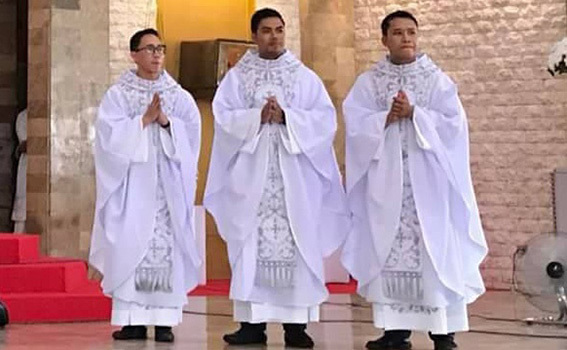 On May 26, 2018, Oblate Bishop Angelito LAMPON, Vicar Apostolic of Jolo, ordained to the priesthood three young Oblates: Fathers Harold LAGNAODA, Roy PACIENTE, and Anthony SOTOMIL. Bishop Angelito, whose predecessor was murdered, knows well that to be a Catholic bishop, priest or religious in his area means danger and could even mean martyrdom. In his ordination homily, he reminded the young priests of this fact. He emphasized the missionary character of the Oblates, which is serving the most abandoned without regard for comfort and endangerment to life, especially in the Vicariate of Jolo. 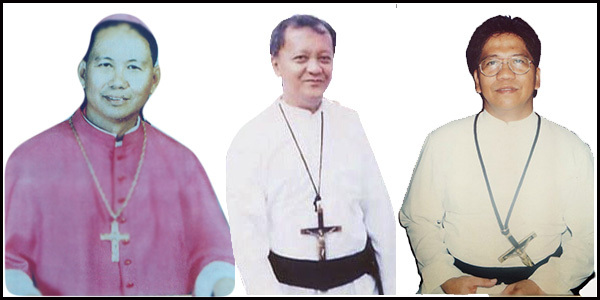 He went on to describe the mission areas largely populated by Islam devotees and extremists, wherein three Oblates gave up their lives as missionaries: Bishop Ben DE JESUS (=1997) who was felled by eight bullets of an assailant; Fr. Benjamin INOCENCIO (=2000) who succumbed to a bullet which pierced his skull and neck; and Fr. Reynaldo RODA (=2008) who was forcibly taken from the chapel of Notre Dame of Tabawan while he was praying, only to be beaten, then killed with knives and bullets. Even one of the ordinandi, Fr. Harold Lagnaoda, who had his missionary exposure in Bongao, suffered an inner ear concussion when the speedboat which he was riding together with Fr. Federico LABAGLAY and seven others on the way to the neighboring island overturned and trapped them under a heavy sea vessel. However, such harrowing conditions are part of being an Oblate – of being ready and willing to lay down one’s life in danger of death. They prayerfully rely on God’s grace and the intercession of the Blessed Virgin Mary.